FIELD, BRITISH COLUMBIA, CANADA–Our study group was fortunate to meet Whitey Hagadorn (Amherst College and Denver Museum of Natural History) and Sally Walker (University of Georgia) for a hike to an exposure of stromatolites in the Pika Formation (Middle Cambrian) near Lake Helen and Lake Katherine in Banff National Park. A stromatolite is a finely-laminated sedimentary rock produced by mats of cyanobacteria in a shallow sea collecting and trapping thin layers of sediment. They are relatively common features in Precambrian sediments (the oldest of fossils, in fact) and become significantly more rare in younger rocks (although they are still around today). These Cambrian stromatolites are interesting because of what they can tell us about Cambrian marine conditions, including tidal dynamics, bioturbation, and grazing herbivore pressures. Stromatolites exposed as domal structures in this eroding outcrop of the Pika Formation (Middle Cambrian) above Helen Lake in Banff National Park. 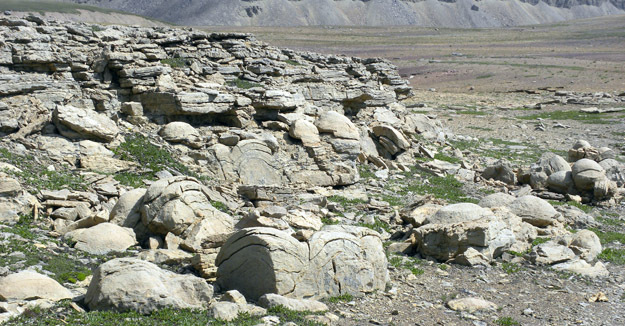 A natural cross-section of the Pika Formation stromatolites showing their laminated nature and sediment which has accumulated around their heads. A hardground (light unit) exposed in cross-section in the sediment between stromatolite heads. This is a layer of carbonate sediment which was cemented on the seafloor and then eroded by currents. The dark sediment was deposited later on top of the scoured surface. The hardground layer had been previously burrowed when still soft. Beautiful folds in the rocks above the Pika Formation stromatolites. They are nearly recumbent in some parts. I'll leave their interpretation to my structural geology colleagues Sam Root and Shelley Judge! A marmot on the banks of Helen Lake. Not at all camera shy, this little guy. 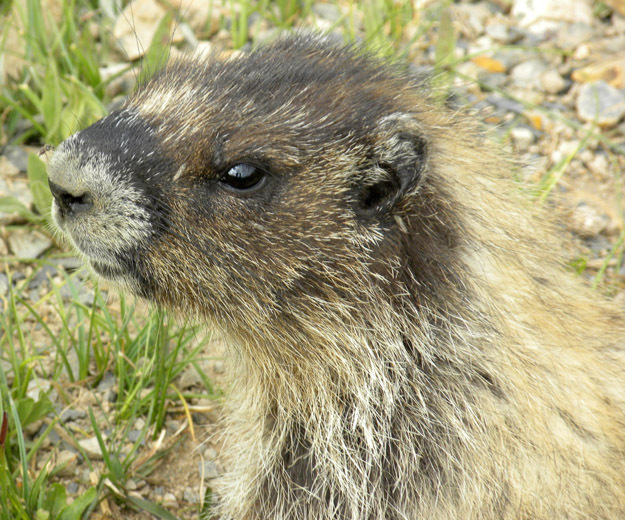 What a cute little marmot guy? 🙂 The geology is cool too.